A deep pot magnet offers high holding forces on parts that are thick and clean with a good surface finish. To make a jig or fixture magnetic, simply drill a flat bottomed hole and a central fixing hole, push the deep pot magnet into it and secure tightly from underneath with a cap screw. The magnets magnetic face can now be ground flush with the surface of the fixture. 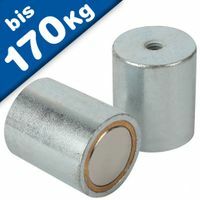 Deep Pot Magnets are Magnetic Holding Assemblies for use where a very strong surface holding magnet is required. 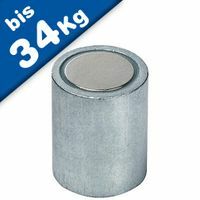 The magnet sits inside a steel case which provides extra strong magnetism on one face only, provides a hole for fixing and also protects the magnet from damage. One of the largest usages of magnets is the application of holding or gripping, the basic principle of the holding or pot magnet is to direct and concentrate the flux from both magnetic poles to one active face. This is usually achieved with steel pole pieces or a steel (brass)-backing cup. The standard selection can be broken down into three material types and there is a great variety of systems available. The Material have Neodymium-iron-boron (NdFeB), Alnico and Samarium-Cobalt (SmCo). The body of Types brass body and steel body. 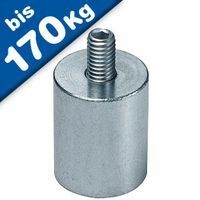 The styles of Types are cylindrical without fitting tolerance h6, pot with fitting tolerance h6, pot with fitting tolerance h6 and internal thread, with internal thread and cylindrical pot with threaded neck. The permanent pot magnets must not be exposed to radioactive radiations for longer duration as it might effect their magnetic strength. This can work within permissible temperature. If these magnets are used beyond permissible temperature limit it might again affect their magnetic strength. 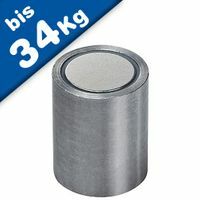 Who supplies high quality Cylindrical Pot Magnets? 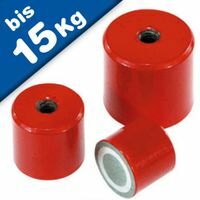 Magnosphere offers best priced Cylindrical Pot magnets globally to all industries, including Automotive, Aerospace, Military, Advertising, Design House, Electronic and Academic/R&D. Please inquire for custom Neodymium magnets or magnetic assembly.